Birchwood Casey Shoot-n-c Self-adhesive 12" and | Kentucky Pawn, Inc. 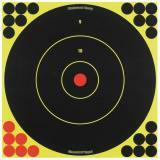 These targets are great for long-range rifle shooting 200 yards and beyond. The greater surface area of the 17.25" makes them the perfect choice for use with muzzleloaders, shotgun slugs and to show shotgun patterning.